Conference rooms are important places where you call staff meetings, get together with valuable clients or legal representatives, discuss the newest product updates, create ad campaigns or screen videos. When clients walk in through your reception room to the conference room, the first initial impression is important to your company's image. Conference room chairs should be solid and substantial with color schemes and styles that match the room's interior yet relaxing to put everyone at ease. It makes no difference if your company is a startup or if a Fortune 500 company when it comes to choosing the best conference room chairs. Meetings in the conference room can last hours on end, so it is vital that the chairs and not only look good, but are also comfortable. 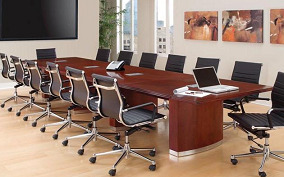 When selecting new conference room chairs, keep in mind the general office atmosphere, whether it is modern or more traditional. Your chairs should reflect and reinforce that same feeling. A laid back office might be fine with modern conference room chairs with mesh or ergonomic chairs, so long as they are comfortable. A legal or medical practice, however, might go for the conventional look of wood and leather. Whatever you choose, take time to coordinate the upholstery with the office's furnishing style. Contact us today to place your order.